Osteopathy is an established recognised system of diagnosis and treatment, which lays its main emphasis on the structural and functional integrity of the body. It is distinctive by the fact that it recognises that much of the pain and disability which we suffer stems from abnormalities in the function of the body structure as well as damage caused to it by disease. 2What kinds of problems can osteopathy help with? 3How much do treatments cost? Treatments are £55 for 30 minute treatment session. The first session can take up to an hour and is £70. 4Do I need a referral from my GP? 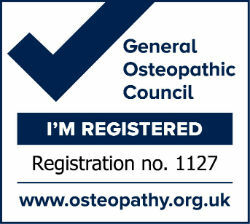 A formal referral from your GP is not necessary, the majority of osteopathic patients self-refer. If you'd like to get treatment paid for by a private health scheme contact your Doctor first. Osteopaths work with their hands using a wide variety of treatment techniques. These may include soft tissue techniques, rhythmic passive joint mobilisation or the high velocity thrust techniques designed to improve mobility and the range of movement of a joint. Gentle release techniques are widely used, particularly when treating children or elderly patients. This allows the body to return to efficient normal function. 6How can I be sure I am in safe hands when visiting an osteopath? A Registered Osteopath has demonstrated to the General Osteopathic Council via a detailed application process that they are a safe and competent practitioner, that they have adequate malpractice insurance and have agreed to abide by a Code of Practice. 7Can I have osteopathy on my private medical insurance?